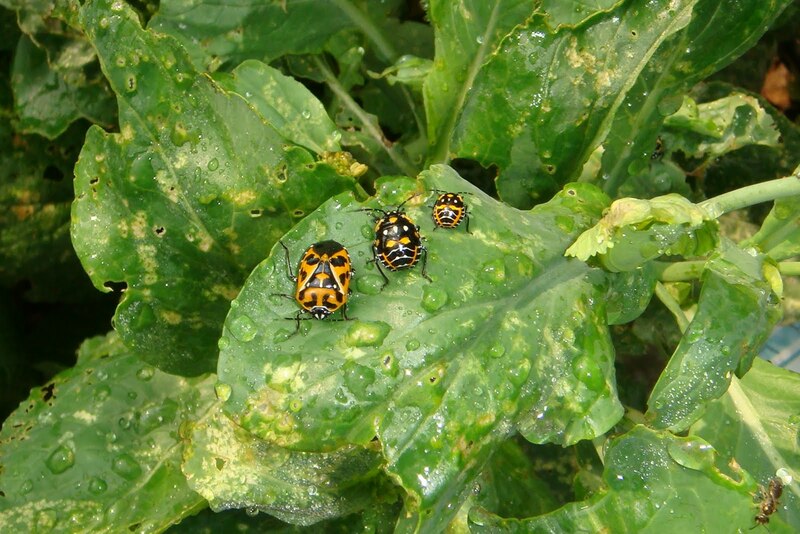 Last year at the Derwood demo garden, we had an awful problem with harlequin bugs (Murgantia histrionica), a pest of the Brassicaceae (cabbage) family. They destroyed our crops of kale, broccoli, radishes, and cabbage, and also attacked the nasturtiums and beans, and completely covered a cleome plant (another favorite host). They were everywhere by the end of the season, and in numbers much to high to continue hand-picking and squashing and drowning, our previous methods of control. Look at that histrionic species name, by the way – I like to know a bit about the history and nomenclature of the bugs I’m squishing, and it’s especially appropriate I’m writing this entry today, since I’m going to see a commedia dell’arte play tonight, and these bugs are named after the servant character Harlequin in that style of theatre, because of the pattern of his costume and the pattern of their coloration. They’re not much for camouflage! (Photo courtesy Barbara Knapp.) Isn’t that a great picture? It’s like they were posing, lined up in their different growth stages. The one on the left is fully mature, but the immature ones are similar to the adults, just differently patterned and smaller. (Photo: Katherine Lambert.) 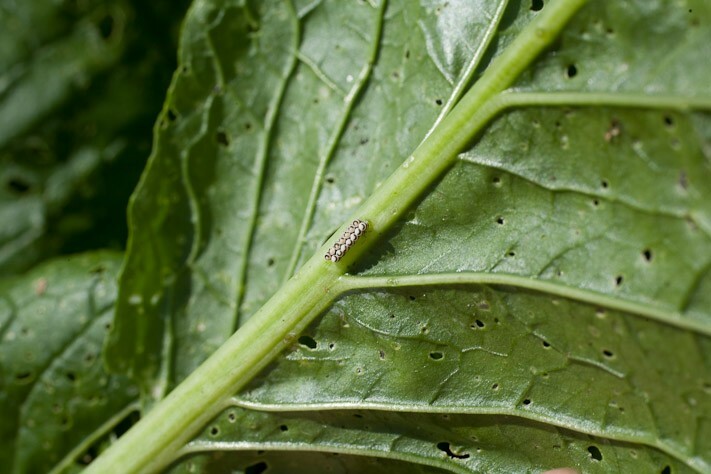 We saw our first actual bug in July on the day Jon came to teach our Grow It Eat It class about garden pests – good timing, bug! – but it was a lonely camper, and didn’t have much of a family developing until August. In retrospect, I think we actually killed off a lot of last year’s bugs by tilling our garden early this spring. The last generation overwinters in the soil, and should emerge when the weather gets warm. Which it took its good time doing this year, of course. Between those factors, I bet the bugs that started laying eggs this summer were newcomers that found our mustard and moved in, not descendants of last year’s bugs. So perhaps a spring trap crop isn’t the best method of control after all – a spring tilling does even better, and a fall tilling might be better yet. It wouldn’t have to be the whole garden, either, just the parts where the bugs congregated in the fall. But here it was August, and we had a ratty row of mustard with harlequin bugs all over it, and fall planting coming up with lots of yummy brassica plants in store. Here’s what we did: dug up the mustard plants, popped them quickly into big garbage bags, tied them off, then searched the soil for escapee bugs and popped those in a final bag, and threw the whole lot in the trash. That was last week. Of course when we got there today there were harlequin bugs on the row of radishes behind where the mustard had been. But not very many, and we squished them, and we’ll keep after them and hopefully get them all, because collard and turnip seeds went in today, and broccoli seedlings will follow soon, and more in that family that are magnets for the pests. And it would be very nice to have a harvest this fall! They might be hard to see in the photo (by Nick Smith, patient son whom I drag out to the garden to photograph things) but they are a good example of a bug that unlike the harlequin is different in the juvenile stage from the brown and armored-looking adult. Kind of cute, I think. (Squish!) This is what happens when you don’t get to the eggs in time (they are usually orange-ish and planted in clusters under the leaf, often in the joints of veins where they are hardest to crush). You can see all these bugs in person (if we haven’t eradicated them) by visiting the garden – any time, but particularly on Saturday, August 29, from 10 am to 1 pm, for our Open House. Google the Agricultural Farm History Park in Derwood for directions. Hope to see you there! Nice pics! My cabbage leaves (both ornamental in the front garden and edible in the veggie garden) have been partially devoured by something, lol. I haven't taken the time to inspect the leaves for critters but I should do that. It could be harlequin bugs but it could be a lot of other things too. Cabbage does take a lot of monitoring, sigh. They are nasty critters, aren't they? And yes, they did survive our demo garden attack, and are currently eating the nasturtiums. So I plan to drown as many as possible next work day, and then plant the new cauliflower, collard and cabbage seedlings with row cover over them. Yuck I can't stand these bugs. I had to pull out all my kale to try to get rid of them! They are now trying to develop a taste for green peppers, the awful things. Would chickens eat them? I am wondering if I can borrow a couple chickens for a day and get them to clear out the garden for me. I am not going to speak for chickens and their tastes. It's worth trying – just remember chickens might also eat seedlings if you have fall crops started. I'd think harlequin bugs would taste awful myself – they seem to only eat strong-flavored plants. Maybe ask the chicken owner what their experience is? Sadly chickens do not eat harlequin bugs … I have been reading about using soapy water sprayed directly onto the beasties. The soap penetrates their protective shield and dehydrates them. Have yet to try it out. Too bad about the chickens. I haven't tried spraying with soapy water; I'm always ready to get rid of them as soon as I see them! But it might work, especially with the smaller ones. They do run away and hide, though. Sadly, I have verified that chickens ignore harelquin bugs. 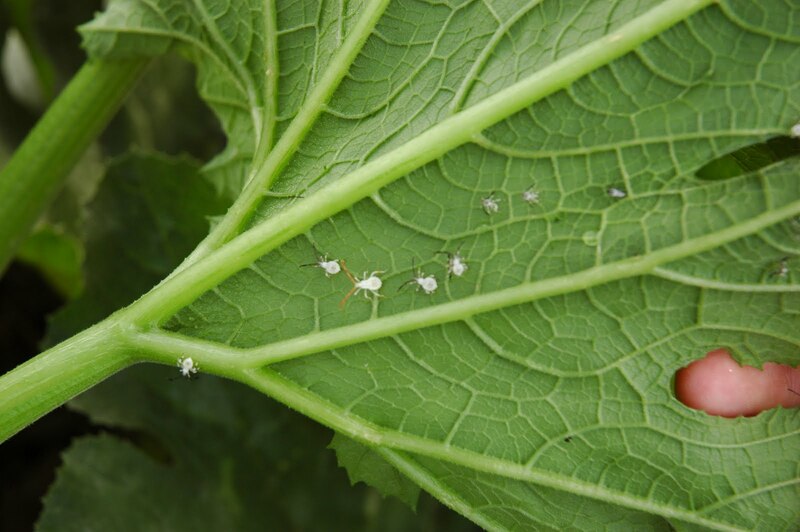 I put my three into my infested collard green crop area and they ignored them flying all around them. Boo Hoo.